Winona LaDuke's latest book reads like a prayer. These are holy words-- inspirational stories taken straight from the heart of indigenous communities throughout the world. The Winona LaDuke Chronicles: Stories From the Front Lines in the Battle for Environmental Justice is lyrical, instructional, and infused with wry humor when the weight of the message becomes unbearable. LaDuke provides a roadmap through tribal nations' belief systems; offering a spiritual compass and invaluable insight into the relationship of prophesy to the realities of climate change, economic collapse, food scarcity and basic human rights. As it happens, prophesy does come true and redemption is possible despite this encyclopedia of environmental and spiritual insults. Are we hell-bent on embracing environmental calamity or is atonement and redemption possible through the lessons offered by indigenous belief systems? How fascinating to learn that corn has a history, that seeds have a profound spiritual meaning, and that plants have a sacred relationship with humans. Provide the environment in which food will flourish and there will be no need for genetic crop engineering. LaDuke is one of the great overlooked orators of our time, and she brings this prowess to every page. Her standard biography is well known. A two time Green Party vice-presidential candidate, LaDuke has 40 years of activism behind her. A graduate of Harvard University, LaDuke is an Anishinaabekwe (Ojibwe) enrolled member of the Mississippi Band of Anishinaabeg. In the preface to Chronicles, she offers testimony to all that life teaches. As for those two losing vice-presidential campaigns, in the essay, "Recovering from the Drama of Elections," LaDuke calls out Republican Speaker of the House Paul Ryan and offers valuable and obvious advice. "People want to be heard." American politics should be defined by diversity rather than establishment money and corporations afforded the status of personhood. The metaphors of fire and resurrection infuse the story telling. "I have now more winters behind me than before me. It has been a grand journey. I am grateful for the many miles, rivers, and places and people of beauty," LaDuke writes. It was after the loss of her home to fire in the early days of a bleak 2008 winter; a loss that included books, a lifetime of memorabilia, and sacred objects, that the orator and writer temporarily lost her voice. LaDuke says she could not write, could not sleep and could barely speak. Memory became tenuous as she struggled with the even more profound losses of her father, the father of her children, and her sister. She equates the rock bottom feeling of PTSD with being "a casualty of the modern Indian Wars." She had lost her loves, her heart and some of her closest friends. But "after the burn" indigenous people know that the fields, the forests and the prairies rebound with new growth. LaDuke found this growth in the writing and the story telling. Now a self-described "modern day bard," she travels across the land, sharing stories from other lands and writing them down along the way. These are her chronicles, at once universal and very personal. 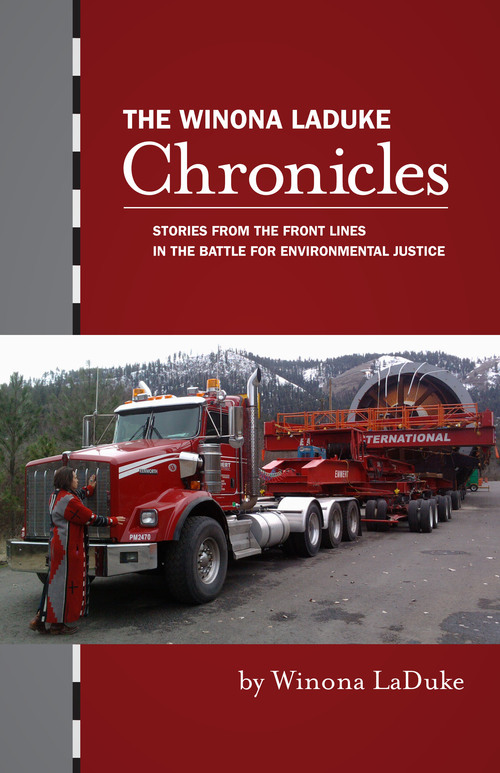 In these days of the great Canadian fire that has devastated Fort McMurray, it is a stunning coincidence that in the early pages of Chronicles, LaDuke tells the story of a 2014 meeting with Archbishop Desmond Tutu there. The town, which has endured much suffering in the current news cycles, is the booming center of the Alberta Tar Sands projects. It is also the ancestral home of the Athabasca Chipewyan First Nation. Tutu was there to speak about climate change and global warming. Media coverage criticized Tutu as being misinformed. Tutu warned that pipelines and oil contribute to the devastation of First Nation lands and livelihood and that the resulting climate change would be devastating. Scientists attribute the Alberta firestorms to climate change. A prophecy fulfilled? The essay "My Recommended Daily Allowance of Radiation," slams the North Dakota Department of Health for approving the increase of radioactive materials scuttled in landfills by a factor of 10 or 1000 percent. (from 5 pico curies per liter to 50) It seems the fracking industry was dumping 27 tons a day at 47 pico curies per liter and the illegal dumping issue needed a quick fix. This all scary stuff and LaDuke lays out the rationale for avoiding radioactive materials, especially since not all of it was making it to the landfills. Radioactive filter socks were thrown in ditches and kids found them to be interesting toys. In that characteristic flash of wry humor, LaDuke quotes a female representative from the North Dakota Oil and Gas Industry. "Nuclear radiation isn't so bad," the rep said. "It's not like Godzilla or anything. It's more like Norm from Cheers, just sitting at the bar." "I want more of whatever psychedelic drug she's taking," LaDuke writes. "In the Time of the Sacred Places" describes two paths to the future. One is scorched and one is green, and the Anishinaabeg would have to choose. (So do we all) Ancient teachings speak of a mandate to respect the sacred. In the millennia since the ancient prophecy, sacred Beings still emerge. LaDuke writes that they emerge in "lightning strikes at unexpected times, the seemingly endless fires of climate change, tornadoes that flatten" and floods. As the Haudenosaunee teaching says, "...Our future is seven generations past and present." We must assume responsibility. LaDuke's fine book is our map. Full disclosure. LaDuke requested a photo taken by this writer for a previous article. It appears on the back cover with credit and was donated.